Cyber security is an issue that is very important for India. With the growing use of Internet banking, ATM machines, credit and debit cards, online banking, etc, banks of India must also upgrade their cyber security infrastructure. Reserve Bank of India (RBI) has taken some very pro active steps in this regard. RBI has made it mandatory to appoint chief information officers (CIOs) and steering committees on information security at the board level at the earliest. The intentions are good and so must be their implementations. 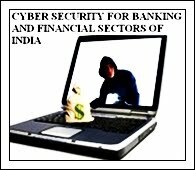 Cyber security cannot be used by banking and financial sectors of India till it is systematically used by them. For that a dedicated cell or wing must be established that can take care of issues pertaining to cyber law, cyber security, cyber forensics, cyber due diligence, etc. Although there are numerous such due diligence requirements yet banks and financial institutions must consider the cyber security aspects on a priority basis. Indian banks and financial institutions are increasingly facing cyber crimes pertaining to banking industry. Further ATM frauds, credit card cloning, phishing attacks against banks and financial institutions, etc are also on rise. Further data security and privacy issues are other areas of concern for banks and financial institutions of India. They must consider data security and privacy issues of their customers very seriously otherwise they would be violating the due diligence requirements under various law, especially the cyber law of India. Data security and privacy in Indian banking industry requires immediate attention of RBI. RBI is already working hard in these directions and its is a matter of time before banks and financial institutions of India would be mandatorily required to ensure strong cyber security, effective data protection and stringent privacy protection of their customers. Are We Prepared For Cyber Terrorism In India? Why Google Is Putting Posts In A Blackhole?